I snapped this shot of two of the four Beluga Whales at Georgia Aquarium when visiting a couple of weeks ago with a good friend who hadn't been. I wasn't going for ethereal, but love the way this photo turned out. The Aquarium is one of my favorite places for photo making. I was at the Aquarium again this past weekend with a dear friend who adopted me as her "Uncle Travie" when she was seven years old. Now she's 10 years in the U.S. Navy and a remarkable young woman. Christina is someone I will always love, admire, and be proud of. While we were there, we of course stopped by to see the Beluga Whales. There's almost always a docent stationed at the exhibit who welcomes questions and also shares general information during their shift. 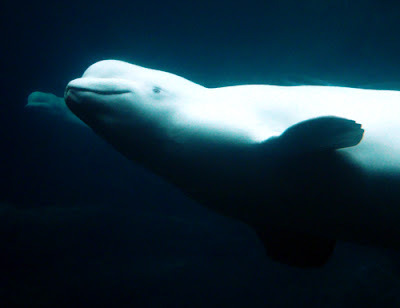 On this particular visit, we learned that the smile you often see on the Beluga Whale is possible because they have flexible lips, reportedly the only whale that does. Georgia Aquarium is one of the most interactive attractions in Atlanta. I love taking visitors to the petting tanks, especially the one with rays and sharks! And the various webcams on their website are cool, too. How cool! That must be a HUGE aquarium!